Hello friends, Today I will tell you a method on how to Send iMessages from Android. Users can send messages from their Android Phone to iPhone directly using iMessages. You can connect Android to iMessages using your Mac and other iOS devices. I have shared the best and most trusted app to use iMessages from Android. iMessage is an Apple’s built-in instant messaging service that allows an ios user to send text, picture, video, sound, and location very quickly. iMessage can be used on the devices that are iPhone, iPad, Mac, or Apple Watch. However, now Apple has added some significant features to iMessage in iOS 10 like bubble n screen effects, emoji tap backs and full-on emojis, Digital Touch n handwriting, etc. In the iMessage, an iPhone user can also view SMS and MMS within the app of those people who do not use Apple device. iMessage gives an incredibly powerful and unified experience to the users. Android is the most used operating system as well as the device which is used by many people across the world. App development and customizations made Android smartphone much popular as compare to others. However, as like iOS user, the Android users can now also use iMessage on Android. From now onwards you can send iMessages from Android. Moreover, Apple does not provide any Android app which helps Android users to send iMessages from Android. But, there is another company which has made an iMessaging featured Android app which can be used to send iMessages from Android. Let’s begin the guide from below and check that how we can send iMessages from Android. Get the weMessage app from Google Play Store on your Android smartphone. After that, head up to your Macbook and go to the weMessage website. Now from there click on the button saying “Download for MacOS”. Then, a file will start downloading. Wait until the download finish. Now, extract that zip file on your Macbook. Under that extracted folder you will see a run. Command file. Now, before we open that file go to the Java official website and get the Java SE development kit for your mac. Install that Java SE development kit on your Macbook. Now, go back to the extracted folder then click on the run. Command file and open it using the terminal. In the terminal, enter your iMessage email and password. After that, in the terminal, you will see the IP addresses. Go to your Android phone and use that IP address to sign in. Now, send any message your Android, and that message will be sent to the iMessage app on iPhone. MAke sure that your Android and iPhone should be on the same network. 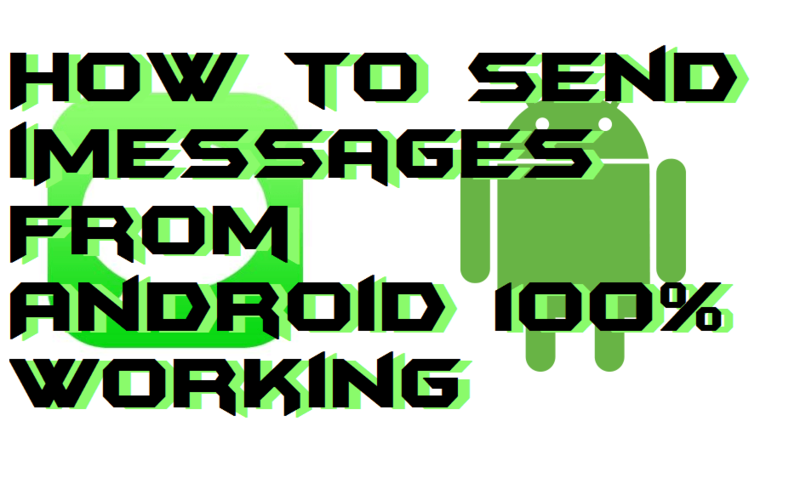 This is the way which will help you to send iMessages from Android. You can now amaze your friend who is having iPhone by sending iMessage to him/her using your Android smartphone. This Android app is safe to download because it is available on Google Play Store and hence Google Play Protect team has verified this app. However, there are more Android apps which can be able to send iMessages from Android. But, this Android app is trusted by 500 thousand peoples so you can use it without hesitating. I hope ow you can send iMessages from Android. Share this marvellous guide with your colleagues that is to learn that how to send iMessages from Android.